nonchalant mom: Meditation and TEA that's for ME! 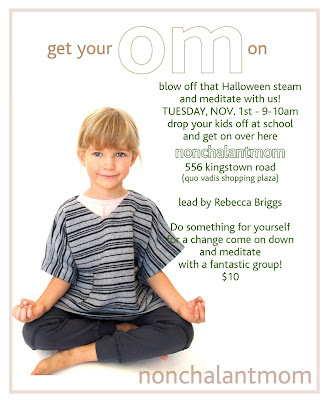 decompress while Rebecca leads you through a meditation - you think you can't? or don't like to? well then you have not tried a guided meditation it's much easier! I also like to call this 'meditation for busy people' (once a week) just think after a few guided meditations you will soon build your own altar in your home, and sit down and meditate on your own. But for now, join us for an hour of tea, meditation, and I am sure there will be a bit of yoga involved. So get those yoga pants on and get yourself to the SHOP! bring a blanket or pillow to sit on - we will have a few extras too!